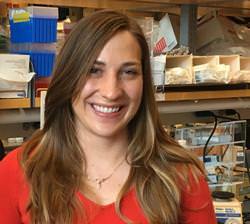 Kelsie Eichel, now a Damon Runyon postdoctoral fellow in the laboratory of Kang Shen at Stanford University, has been selected to receive the 2018 Merton Bernfield Award. She will be honored with a plaque, $1,000, and a chance to speak at the Organelle Homeostasis Minisymposium during the 2018 ASCB|EMBO Meeting in San Diego. Her talk is on Tuesday, December 11,at 5:20 pm. Her current work is focused on how neurons use polarized membrane trafficking mechanisms to selectively transport proteins to axons or dendrites. Understanding how neurons produce elaborate membrane protein compartmentalization is critical to understanding basic neurobiology as well as diseases of the nervous system. The selection committee commends runner-ups Alexander Muir, Erin Langdon, and Takashi Akera for their outstanding work.